“Organic materials, which are important building blocks for life, are often found in comets and primitive asteroids,” said Jim Shirley, a research scientist at NASA’s Jet Propulsion Laboratory, Pasadena, Calif. Shirley is giving a talk on this topic at the American Geophysical Union meeting in San Francisco on Friday, Dec. 13. 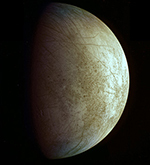 “Finding the rocky residues of this comet crash on Europa’s surface may open up a new chapter in the story of the search for life on Europa,” he said. An International Collaboration of FACom researchers and Astronomers of the University of Texas (El Paso) and New Mexico State University, have discovered a physical mechanism that could make binary stars more hospitable to habitable planets than single stars. The discovery could imply a modification in the estimations of the number of planets potentially harboring life in the Galaxy and in the future selection of targets for the search of life elsewhere. Habitability is the term astronomers use for referring to the general condition a planet must fulfill in order to be suitable for life. It has been customary to think that habitability is determined mainly by the amount of light a planet receives from its host star. If the planet receives too much light it is too hot and water will be boiling in its atmosphere (if it has one!). On the other hand, if the planet is too far and light from the star shines weakly, the surface is too cold and water becomes frozen. In the middle between these extremes lies the so called “radiative habitable zone” also nicknamed the “Goldilocks Zone”. But planets in the Goldilocks Zone need to meet other conditions to be considered actually habitable. One of the most important is having a dense and wet atmosphere where heat could be trapped and water could condensate at the surface. But preseving an atmosphere is a real challenge for a young planet. From a distance, most of the Saturnian moon Dione resembles a bland cueball. Thanks to close-up images of a 500-mile-long (800-kilometer-long) mountain on the moon from NASA’s Cassini spacecraft, scientists have found more evidence for the idea that Dione was likely active in the past. It could still be active now. Other bodies in the solar system thought to have a subsurface ocean – including Saturn’s moons Enceladus and Titan and Jupiter’s moon Europa – are among the most geologically active worlds in our solar system. They have been intriguing targets for geologists and scientists looking for the building blocks of life elsewhere in the solar system. The presence of a subsurface ocean at Dione would boost the astrobiological potential of this once-boring iceball. Until recently, one of the ultimate mysteries of the universe — how many civilizations may exist on planets orbiting other stars in the Milky Way Galaxy — relied on the possibility of detecting intelligent beings by radio signals. Now a team of astronomers, engineers, and physicists from the University of Hawaii, the University of Freiburg, and elsewhere has proposed a new and powerful technique to search for intelligent life. The revolutionary method is described by four of the team’s astronomers in the June 2013 issue of Astronomy magazine, the world’s largest magazine on the subject, with a print and web readership of half a million each month. The story, “How to Find ET with Infrared Light,” was written by Jeff R. Kuhn of the University of Hawaii’s Institute for Astronomy, Svetlana V. Berdyugina of the University of Freiburg and the Kiepenheuer Institute for Solar Physics in Germany, David Halliday of Dynamic Structures, Ltd., in British Columbia, and Caisey Harlingten of the Searchlight Observatory Network in The Grange, Norwich, England. Rather than looking for radio waves, the team suggests searching for the heat signatures of nearby planets, which requires a giant telescope that could detect infrared radiation directly from an exoplanet, thus revealing the presence of a civilization. “The energy footprint of life and civilization appears as infrared heat radiation,” says Kuhn, the project’s lead scientist. “A convenient way to describe the strength of this signal is in terms of total stellar power that is incident on the host planet.” The technique arises from the fact that a civilization produces power that adds to the heat on a planet, beyond the heat received from its host star. A large enough telescope, idealized for infrared detection, could survey planets orbiting stars within 60 light-years of the Sun to see whether or not they host civilizations. Gone are the days of being able to count the number of known planets on your fingers. Today, there are more than 800 confirmed exoplanets — planets that orbit stars beyond our sun — and more than 2,700 other candidates. What are these exotic planets made of? Unfortunately, you cannot stack them in a jar like marbles and take a closer look. Instead, researchers are coming up with advanced techniques for probing the planets’ makeup. One breakthrough to come in recent years is direct imaging of exoplanets. Ground-based telescopes have begun taking infrared pictures of the planets posing near their stars in family portraits. But to astronomers, a picture is worth even more than a thousand words if its light can be broken apart into a rainbow of different wavelengths. Those wishes are coming true as researchers are beginning to install infrared cameras on ground-based telescopes equipped with spectrographs. Spectrographs are instruments that spread an object’s light apart, revealing signatures of molecules. Project 1640, partly funded by NASA’s Jet Propulsion Laboratory, Pasadena, Calif., recently accomplished this goal using the Palomar Observatory near San Diego.